The CMA CGM ALEXANDER VON HUMBOLDT, second of the world’s largest and state of the art containership’s series, begins its first voyage today, Friday, April 19th in Pusan, South Korea. Built by DSME (Daewoo Shipbuilding and Marine Engineering) in South Korea, this giant of the seas displays exceptional dimensions: 396 meters long, 54 meters wide, with a draft of 16 meters and sails under the UK flag. In line with the sustainable development policy of the Group, the CMA CGM ALEXANDER VON HUMBOLDT is equipped with all the latest environmental technologies. The CMA CGM ALEXANDER VON HUMBOLDT is the second of a series of three 16 000 TEU vessels, the first being the CMA CGM MARCO POLO, all to be named after great explorers. 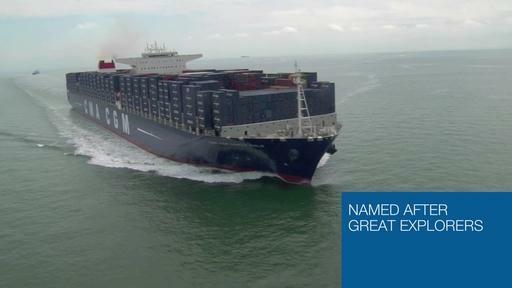 The delivery of the third vessel of the series, the CMA CGM JULES VERNE, which will sail under the French flag, is expected at the beginning of May 2013. The CMA CGM ALEXANDER VON HUMBOLDT will be christened, Tuesday 30th May 2013 in Hamburg, in presence of her godmother, Dr. Dorothee Stapelfeldt, Second Mayor of Hamburg, Mr. Olaf Scholz, Mayor of Hamburg and Mr. Jacques R. Saadé, CMA CGM Group’s Chairman and Chief Executive Officer . Operated on the emblematic line of the Group, the « French Asia Line » (FAL 1), the CMA CGM ALEXANDER VON HUMBOLDT will call at Pusan (19 April), Qingdao (21 April), Ningbo (24 April), Shanghai (26 April), Xiamen (29 April), Hong Kong (30 April), Chiwan (1 May), Yantian (2 May), Port Kelang (6 May), Suez (19 May), Tanger (23 May), Southampton (27 May), Hamburg (29 May), Bremerhaven (31 May), Rotterdam (2 June), Zeebrugge (3 June), Le Havre (5 June), Malta (11 June), Suez (14 June), Khor Al Fakkan (22 June), Jebel Ali (24 June), Port Kelang (3 July) and Ningbo (10 July). The FAL1 operates the largest vessels of the CMA CGM fleet and offers its customers a fixed-day, weekly connection between Central and South China, the main exporting zones of the country, and Northern Europe. Who is Alexander von Humbolt ? Alexander von Humboldt is a German naturalist, geographer, and explorer, born September 14, 1769 in Berlin and died May 6, 1859 in the same city. Humboldt is considered as the father of modern geography. He cleared and applied two principles that make geography a distinct science of physical and biological sciences. He is the younger brother of Wilhelm von Humboldt, Minister of Prussia and German philosopher, who, as a visionary for research and education, founded the Humboldt University of Berlin in 1810.